Global color mosaic of Triton, taken in 1989 by Voyager 2 during its flyby of the Neptune system. Color was synthesized by combining high-resolution images taken through orange, violet, and ultraviolet filters; these images were displayed as red, green, and blue images and combined to create this color version. With a radius of 1,350 (839 mi), about 22% smaller than Earth's moon, Triton is by far the largest satellite of Neptune. It is one of only three objects in the Solar System known to have a nitrogen-dominated atmosphere (the others are Earth and Saturn's giant moon, Titan). Triton has the coldest surface known anywhere in the Solar System (38 K, about -391 degrees Farenheit); it is so cold that most of Triton's nitrogen is condensed as frost, making it the only satellite in the Solar System known to have a surface made mainly of nitrogen ice. The pinkish deposits constitute a vast south polar cap believed to contain methane ice, which would have reacted under sunlight to form pink or red compounds. The dark streaks overlying these pink ices are believed to be an icy and perhaps carbonaceous dust deposited from huge geyser-like plumes, some of which were found to be active during the Voyager 2 flyby. 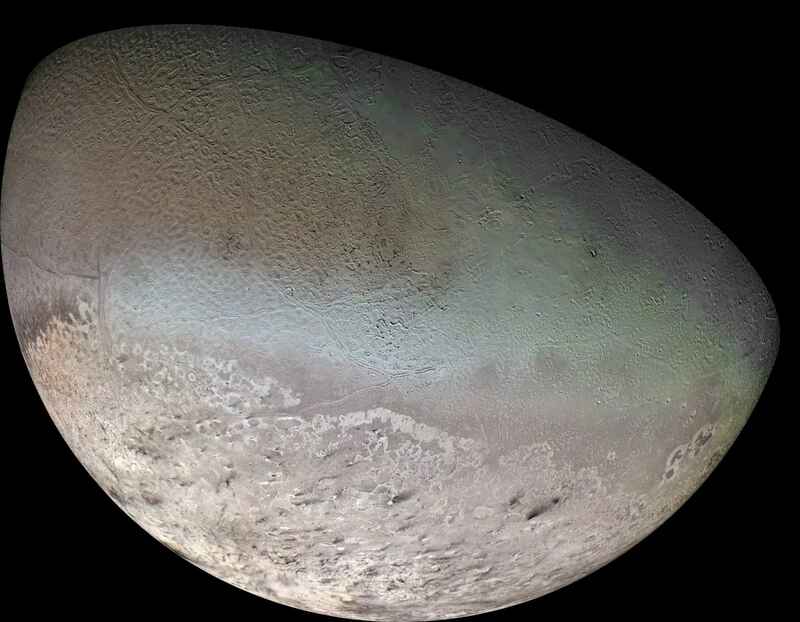 The bluish-green band visible in this image extends all the way around Triton near the equator; it may consist of relatively fresh nitrogen frost deposits. The greenish areas includes what is called the cataloupe terrain, whose origin is unknown, and a set of 'cryovolcanic' landscapes apparently produced by icy-cold liquids (now frozen) erupted from Triton's interior.